Choosing the right level and program of study is a big decision. Canada's constitution allows each province and territory to deliver its education programs. Despite regional differences, however, Canada's colleges, universities, and polytechnics use similar terms to describe common pathways and credentials. The length and composition of these programs is an important decision for prospective international students, as it may have a direct effect on eligibility for employment and immigration opportunities in Canada. Undergraduate education in Canada follows completion of senior secondary or high school. The full duration of a standard undergraduate education (culminating in a bachelor's degree) is three to five years. International students should budget a minimum of four years to complete a bachelor's (undergraduate) degree. With a completed bachelor's degree, and the right combination of language skills and experience, international students may become eligible for a number of provincial and federal immigration programs. They may also decide to pursue a Master's degree, which requires completion of a bachelor's degree. Canada also offers a number of certificates, diplomas, and Associate Degrees at the undergraduate level. While these do not qualify students to undertake Master's degree in Canada, they may be useful for immigration or employment purposes. A typical certificate in Canada involves three to eight academic months of post-secondary study in a single subject. Common subject areas include Business, IT, Health Care Administration, and other pre-diploma or pre-degree options. The aim of a certificate is to give post-secondary students the skills and knowledge for an entry-level vocation. All colleges and universities offer certificate programs of different lengths. A Canadian secondary school diploma or essential subject prerequisites are required for admission into a certificate program. College diplomas in Canada most often comprise a minimum of two full-time academic years of specialized post-secondary study. Like certificate programs, diploma programs are mainly developed to meet specific demands of trades and technical or vocational careers, and – depending on the job required - may span upwards of three of four years. Diploma programs are also likely to have a co-op internship component or other apprenticeship options, and diplomas can be upgraded or transferred into a bachelor’s degree. Admission into a college diploma program requires a completed senior secondary program in Canada (or its equivalent). An Associate Degree in Canada is a 60-credit, foundational undergraduate program in a classical area of study (such as Sciences or Arts). Unlike certificates and diplomas, Associate Degrees comprise a breadth of general academic subjects as well as a specialization in an area of interest (similar to a major). Common examples include the Associate of Arts (Business) and Associate of Arts (Science). The Associate Degree allows students to begin their studies at one college or university and transfer into third-year coursework at a university, pending recognition by the receiving institution. A bachelor’s degree in Canada normally signifies completion of four years of full-time post-secondary education. Subject areas most often include traditional academic subjects in Business, General Sciences, Engineering, the Arts, or Humanities. In this arrangement, students are expected to gain general and foundational knowledge over their first one or two years, and then specialize in a concentration called a major. Some faculties offer a fifth professional year comprising a supervised practicum (for example, for teachers’ certifications). Admission into a bachelor’s degree program requires a completed senior secondary diploma in Canada (or its equivalent). In Canada, a number of diplomas and certificates may be taken following the completion of a bachelor’s degree. These programs may comprise approximately two to three semesters of full-time study. Graduate diplomas and certificates can transfer into master’s degrees. Frequently, they may operate as an additional compliment to a bachelors degree, and show intense specialization in one subject area. Common subject areas include Business Administration, Sales and Marketing, and Resource Management, to name a few. Master’s degrees comprise one to three years of highly-specialized post-graduate study, and may lead to professional practice. These degrees are conferred by universities and tend to build on previous study areas explored at the bachelor’s level. Programs often expect the student to propose and conduct significant original research culminating in a major project, thesis, and/or comprehensive examination. Master’s degree programs in Canada require completion of a bachelor’s degree. In general, a doctorate in Canada comprises at least two to three years’ equivalent full-time study in comprehensive and analytical coursework, followed by an independent dissertation or thesis. PhDs and other doctorates are required for many professions such as university professor, doctor, or high-level administration jobs in government, health care, and education. The average timeframe to complete a Doctorate is four to six years. Do colleges and universities in Canada offer the same credentials? Generally speaking, career colleges and applied arts and technology colleges offer certificates and diplomas, while universities confer bachelor’s, master’s, and doctoral degrees. Increasingly, however, accredited public colleges in Canada confer bachelor’s degrees and a limited number of graduate certificates and diplomas. Many universities also offer post-graduate certificate and diploma programs. What are university transfer programs? Many students go directly to university after finishing high school, while others decide on a college first. Many colleges collaborate with universities to allow students to transfer to university after one or two years of full time study at a college. Can credits be transferred from a school, college, or university outside of Canada? While overseas diploma and certificate programs are not nationally recognized towards completion of a Canadian bachelor’s degree, individual partner schools may have articulation agreements, allowing students some transfer standing for completed undergraduate study at the first or second year level. Certain high school programs outside of Canada, such as International Baccalaureat or A-Level certificates, may be applied towards a bachelor's degree, so that an international student may be able to enter directly into the second year of an undergraduate program. However, the completion of equivalent overseas bachelors’ programs (i.e. : similar four-year programs) may be used as a prerequisite for admission to postgraduate programs in the country. 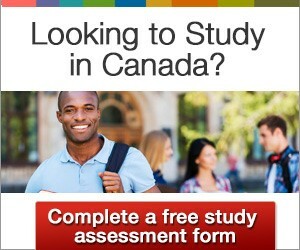 For more frequently-asked questions about studying in Canada, click here.